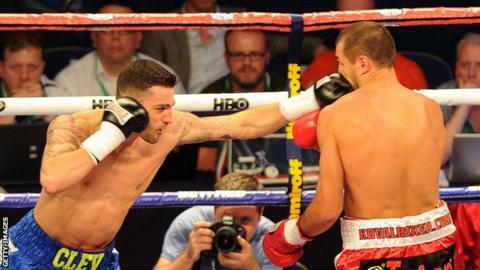 Former world light-heavyweight champion Nathan Cleverly will face Sean Corbin in his long-awaited cruiserweight debut in Cardiff on 17 May. Cleverly returns to the ring for the first time since losing his WBO light-heavyweight title to Sergey Kovalev in August, his first defeat in 27 fights. Injuries have delayed the Welshman's cruiserweight debut three times. The 27-year-old will face Guyana-based WBC Caribbean champion Corbin, who has won 17 of his 21 fights. "I can't wait to see Nathan back in action at cruiserweight," said Cleverly's promoter Eddie Hearn. "Corbin has only been beaten when he has stepped up to the top level and will come into the fight with plenty of size and ambition. "Nathan must win, and look good doing so, with so many huge fights just around the corner." Cleverly's fight is on a Motorpoint Arena card that also features featherweight Lee Selby fighting Romulu Koasicha in an official eliminator for the WBC title. And former lightweight world champion Gavin Rees faces a rematch with fellow Welshman Gary Buckland, who won their original fight in February on points.